Bonus Pai Gow poker is great variation of poker game that is available to play at online casinos where it is just you and the dealer to play. In this poker game you have to Split two separate hands from the seven card you have been given to beat the two hands of the dealer. You also have to make a Bonus bet which is made according to the strength of your seven cards as one undivided poker hand. The Bonus Pai Gow Poker is played with a deck of 53 cards, including a joker. The joker is a limited wild card, meaning that it acts as a wild card only to complete a straight, a flush, a straight flush, or a royal flush. Otherwise, the joker is considered as an ace. This poker variant is unique owing to the presence of attractive bonuses and the Joker. The function of the Joker in this game is unlike any other game of poker. Here, the Joker cannot be used as a wild but as said above you can use it to create a Flush, a Straight, a Straight Flush, or a Royal Flush. In all other combinations, the Joker assumes the value and function of the Ace. 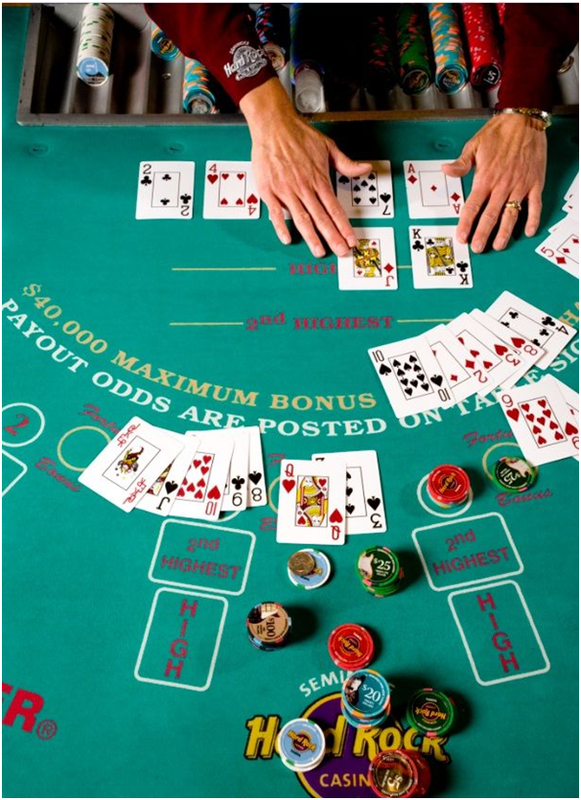 How to play Bonus Pai Gow Poker at online casinos? All you need is to find an online casino that offers bonus Pai gow poker variant. The game screen loads and you can now place a bet by selecting a chip size and clicking on the betting circle on the virtual poker table. Each left click adds a chip each right click takes away a chip. Now you and the dealer are each dealt seven cards. Your cards are face up, and the dealer’s cards are face down. You must divide your seven cards into two poker hands: a High Hand (or known as Highest) consisting of five cards, and a Low Hand (or known as the second Highest) consisting of two cards. According to the rules of Pai Gow Poker, the value of your High Hand must be higher than the value of your Low Hand. You may not, for example, have a pair of 4s for your High Hand and a pair of 6s in your Low Hand. When playing online you have to divide your hand by clicking on the two cards that you want in your Low Hand. Alternatively, if you prefer, you may click on the House Way button and the computer will divide your cards for you pursuant to what it considers optimal Pai Gow Poker strategy. After you have divided your cards into two poker hands, click the Play button. The dealer now turns over his cards, also split into a 5-card High Hand and a 2-card Low Hand. The outcome of the online Pai Gow Poker game is determined by comparing your High Hand to the dealer’s High Hand, and your Low Hand to the dealer’s Low Hand. Pai Gow Poker hands are valued according to the standard ranking of poker hands. A royal flush, of course, is the best poker hand you can get. A straight completed by a ten, jack, queen, king and ace is the highest-ranking straight. An ace, two, three, four, and five is the second-highest ranking straight. All other straights are ranked according to their high card. If your High Hand beats the dealer’s High Hand, and your Low Hand beats the dealer’s Low Hand, you win the Pai Gow Poker game and a payout equal to the amount of your bet minus a 5 percent commission. If the dealer’s two Pai Gow Poker hands beat both of your corresponding hands, you lose the game and you lose your bet. If one of your hands beats the dealer’s corresponding hand, and your other hand loses to the dealer’s corresponding hand, the game is a push, which means that you get your bet back with nothing lost and nothing gained. If your High Hand is the same as the dealer’s High Hand, or your Low Hand is the same as the dealer’s Low Hand, it is called a Copy and the dealer wins that particular hand. You can use good poker hands in Pai Gow Poker game play. As the strongest hand in this poker variant is a Joker with four Aces, followed by the Royal Flush and the Straight Flush. The next hands include 4 of a Kind, the Full House and the ordinary Flush, which is followed by a Straight, 3 of a Kind, 2 Pairs and finally a single Pair. In this poker variant players have the opportunity to place bonus bets when they place the main bet. The size of the bonus amount depends on the strength of the players’ initial seven-card hand even before they create a high hand and a low hand out of it. The bonus payouts are displayed on the screen; and the maximum that any player can win is 25,000 units. The Bonus Bet in Bonus Pai Gow Poker is but optional. 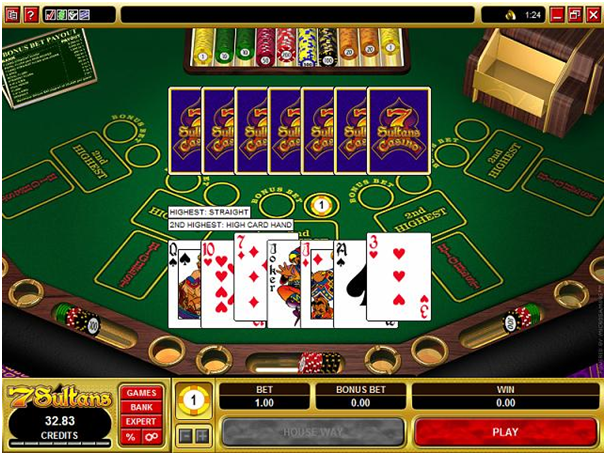 The Bonus Bet is made at the beginning of the game, when the main bet is placed. To place a bonus bet, left-click the Bonus Bet circle. Each click adds one chip to your Bonus Bet. Your Bonus Bet may be higher, lower, or the same as your regular Pai Gow Poker Bet. There are two important rules to understand about the Bonus Bet. The first is that your cards are not divided into two hands for the Bonus Bet. The Bonus Bet looks at all seven of your cards as one poker hand. So if you have three of a kind in your High Hand, and a pair in your Low Hand, you will have a full house for purposes of the Bonus Bet. The second important rule is that the Bonus Bet is not played against the dealer. If you have a winning poker hand — defined as three of a kind, a straight, or better — you win the Bonus Bet. It’s that simple. The dealer’s cards, whether higher or lower than yours, are completely irrelevant. If you win the Bonus Bet with a winning poker hand, you are paid pursuant to the Bonus Payout table. Straight (five cards in sequence) pays 2 to 1. Full House (three cards of one denomination and two cards of another denomination) pays 5 to 1. Four of a kind (four cards of the same denomination) pays 25 to 1. Royal flush pays (10, jack, queen, king, and ace of the same suit) 150 to 1. Five aces (four aces plus a joker) pays 400 to 1. Seven-card straight flush with joker pays 1,000 to 1. Royal flush plus pair of deuces pays 2,000 to 1. 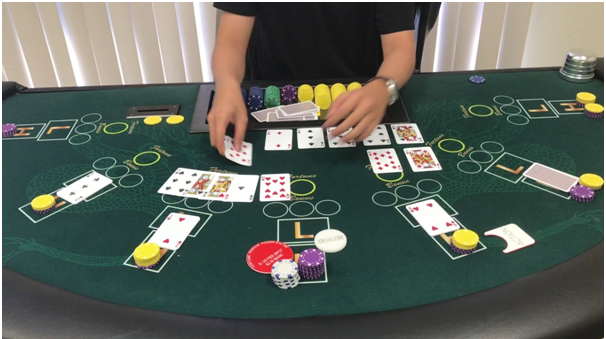 Seven-card straight flush pays 8,000 to 1. The amount of your payout on a winning Bonus Bet is determined by multiplying the amount of your Bonus Bet by the payout odds. For example, if you placed a Bonus Bet of $10, and you got four of a kind (25 to 1), you win $250 ($10 x 25) and your bonus bet is returned to you. No commission is taken from Bonus Bet winnings in the online casino gaming session. If you want to take it easy, you can play the House Way and have a good chance of winning Pai Gow Poker. The Bonus Bet gives you a chance to hit a real jackpot if you get the right cards.